Explain the historical comparison the cartoonist is making. U.S. Secretary of State John Kerry, representing the Obama administration, has signed a deal with Iran over its nuclear weapons in which the U.S. will ease sanctions on Iran in exchange for Iran’s promise to pause work on their nuclear (weapons) program. 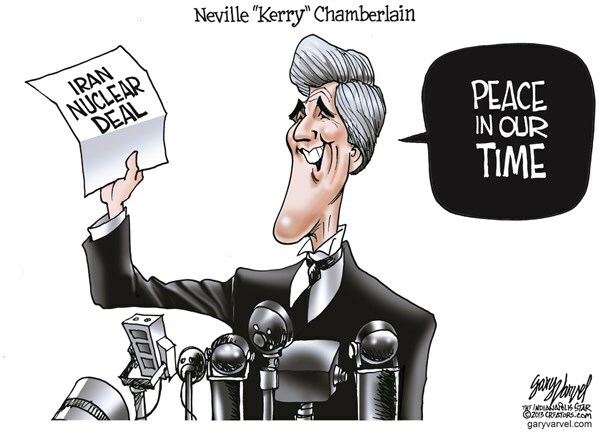 The cartoonist compares Secretary of State Kerry to British Prime Minister Neville Chamberlain, who in 1938 signed a treaty with Hitler allowing Nazi Germany to take parts of Czechoslovakia in exchange for a promise of peace. Chamberlain’s foreign policy was one of appeasement, which is how many view the Obama administration’s policy with Iran, and believe the Iranian leaders are liars the way Hitler was.